If you’ve installed a modern version of OS X and rebooted or ended up at the lock screen, you may have noticed that a new “Guest User” account appears at the login screen. This is not a full guest user account, if you select the Guest User option at login, the Mac will restart to a secured Safari-only version of the OS with access to the internet. So what’s the point of this? It turns out this is part of setting up iCloud in Mac OS X, specifically the “Find My Mac” feature. The Safari Guest User allows someone to get online so the Mac can be located, but prevents the Safari user from accessing your files and applications. We’re going to highly recommend keeping the Guest User Safari account enabled so that if you happen to lose your Mac, or if it’s stolen, it could easily be tracked down. Nonetheless, here’s how to turn this off if you don’t need it for some reason. That’s it, no more guest account on boot. This prevents the Guest User account from being visible at the login screen both during reboot and at the login screen. Again, it’s highly recommended to keep this enabled for security purposes, but if your Mac is locked down with a security cable or you don’t have any use for Find My Mac, you could disable this and not feel too bad about it. This computer will restart to a secure, Safari-only system for the Guest user. The reboot process is quick and opens directly to Safari, there is no access to anything else. No Finder, no preferences, nothing. This first started appearing after users installed Mac OS X 10.7.2, but Guest User has stuck around since then in all modern versions of OS X. Thanks to Brad Caldwell for the questions and screenshot via Twitter, you can follow us there too. there isn’t this option for me? Click on the Advanced options button. It looks a little different than the above, but you get the “Disable restarting to Safari when screen is locked” button. I also do not have that option. Thanks for the article but I don’t have this option. Did you photoshopped it? I have a disabled guest account which I can enable or delete at the user system pref though. No, we don’t alter screenshots except to emphasize how-to’s. If you disabled the guest account that may be why the option isn’t visible to you. i have to wait for about few days after 10.7.2 installed then only the option appeared..
what i did was, system preference – users&groups – unlock – login option – display login windows as Name and password – lock, done. 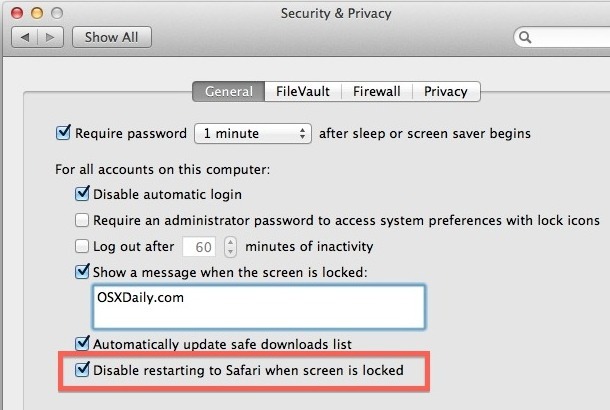 Disabling the guest account in Users & Groups does not disable the Safari-only guest access from a locked screen. I don’t have this option neither. I have FireVault active. Maybe this is the reason? Wow! I thought it was pretty odd (and annoying) to have that guest account there but after reading this article I’m convinced to keep it. Thank you. i totally agree! i thought it was stupid to have a guest account when you disabled it in the first place, but now that i know its for security purposes it makes sense. i have mine locked down hard with a cable, it should be really tough to steal mine, but even if they are able to, that account will be useful. thanks for the article. And what if there is only the guest user icon available in the start up screen? I can’t see my admin icon, only the guest one… How do I get to log in my admin account? Thank you for explaining it. I also thought it was pretty annoying to have that guest account. Your explanation worked perfectly on my iMac and MacBook. Many thanks for your help. Of course, enable “find my mac” in the icloud prefpane ! Thanks!!! for some reason it was bothering me. Hi, not sure if this is supposed to happen, but I just logged into my guest account to see what was available, and even though it said safari only, I also had access to Mac OS Utilities such as Terminal, Net utility and one other. Pretty giving a guest access to terminal is bad! brilliant, so annoying when i saw it this morning, thanks for the fix! FYI, you only get this is if you have “Find my Mac” enabled on iCloud. It isn’t a feature of 10.7.2 per se, just iCloud. I was wondering why this appeared, so thanks for the tip. man..thankss si much this was freaking me out.. it really wass. i must be missing something. how do you use the login to find a mac if the mac is lost/stolen? i mean, i can’t log into my computer as a goes if the computer is gone. so how is this useful? I tried this and it worked, thank you! I thought it had to do with adding a guest user to share files with my pc but even when i disabled that guest user, Id still get the login screen with it…this worked right away. No, that’s simply retarded. If I lose my Mac, insurance will buy me a new one. “Guest” option disabled. I installed the 10.7.3 combo update and this feature wasn’t included. I feel disappointed. I have 10.7.3 and that is not an option …what do I do now? I did the same thing and had to Quit Safari and power down, then power back up. If you cannot find the “Disable restarting to Safari when screen is locked” option, click on the “Advanced” button and it will show up. This bothers me to a great extreme that it is not an option in plain view. I should not have to search the web to find out the last step to safe guard my Lion install. After install update 10.7.4 I can’t login. Just only grey screen and Guest User . Yesterday I was in apple shop , they couldnt fix this problem. Offer ed me full formatting but all of my installed applications will gone!!! May be somebody here can help to resolve this problem? Thanks beforehand . Thank you. I had NO idea why the Guest login was there, since I had disabled the guest account. This helps a lot! Due to your recommendation, I will go ahead and leave the Safari-only Guest login around. Thanks again! I’m sorry, but I don’t understand the process in case I lose my Mac. What’s the use of Guest account? Will the thief login and say “Hello, bite me, I’m here!”? What’s the point? This feature is useless for me. How I can disable guest user account at Mac OS X Lion? Only guest user account shows in my LogIn Screen. I can’t use my account(administrator?). . . .
And how do I get out of the guest account if someone clicks on it and I am stuck in there? HELP!!! I am serious about this! Thanks for the great article! I’m going to keep this feature. Thanks again! WHAT HAPPENS IF YOU TURN OFF THE MAC WHILE IT IS RESTARTING??!?!?! After lending my Macbook to a friend who’s house was robbed, it now boots into guest Safari only mode every time. I can boot in Safe Mode to get access to the admin account, but I can’t stop it from booting into guest. I tried the instructions above, but it still booted into guest safari only. Please help! I upgraded to Yosemite and now the guest is listed as main administrator. Then when I go to system preferences, groups, and try to unlock to delete guest administrator, a user name and password screen pops up. But it does not accept my user name and password. Is the username and password for Apple the same as administrator username and password? I am the owner of this MAC and I and an attack in November 2016 has made a mess of my passwords. The situation now is that my name has been spelled in a lot of ways and I tried Safari, Google and several others, that only made it worse. Of all the name spellings, the correct one ended me up as a guest. I have found at least 5 different spellings that started with the MAC saying that the password or address I tried was already occupied. Try a new one…Now I am 3 persons on FaceBook and more persons on Google and it is impossible to use the right combination. I somehow must delete the wrong spellings and only use one websight I suppose.